It is time once again for one of my favorite local film festivals, the “Seattle 48 Hour Film Project”! 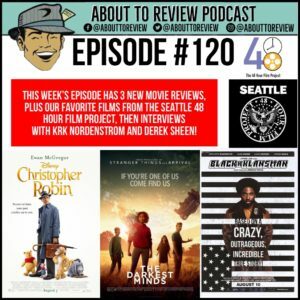 Dr. Andy returned to the studio to talk about our festivals favorites, plus I review 3 new films: “Christopher Robin”, “The Darkest Minds”, and “BlacKKKlansman”! This episode starts off with me reviewing the three new films “Christopher Robin”, “The Darkest Minds”, and “BlacKKKlansman” solo, then Dr. Andy drops by to talk all about the amazing group of films we saw this year at the Seattle 48 Hour Film Project. Finally, to wrap up the episode, I interviewed comedian Derek Sheen who was the master of ceremonies, and city producer Krk Nordenstrom. The 48 Hour Film Project is an annual competition and film festival that challenges teams of film makers to write, shoot, edit, finalize, and turn in a film made from scratch within 48 hours. Every year we are blown away by the crazy amounts of creativity and ingenuity in the films, and this year was no different! I highly encourage you to seek out the film makers from the teams below and try to check out their films. If there is really one you want to see, hit me up and I will see what I can do. Please vote for the “About To Review” podcast in the Renton City Comic Con Geek Awards, click this link -> Renton City Comic Con Geek Awards. Thank you to Dr. Andy, Krk Nordenstrom, and Derek Sheen for all of their help, and make sure to follow them from the links below!